Few meals bring up fond memories of our childhoods more than this staple, which is still one of the most popular processed foods in the market. Here we present a quick and easy variety that will surely please while making sure that your family is enjoying a heart-healthy entrée. Serve with our Roasted Vegetables. 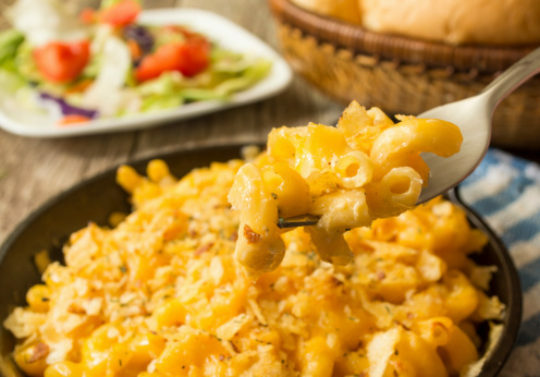 Our mac and cheese, packed with dietary fiber and antioxidant-rich carotenoids, is a sure winner over traditional macaroni and cheese, which has 25 percent more calories and double the fat! Coat an 8 x 8 baking dish with cooking spray and set aside. Cook the pasta according to package directions, drain and set aside. In a saucepan, stir the cornstarch into 1 tablespoon of the evaporated milk, then whisk in the remaining milk. Add the cheese, mustard to taste and pepper. Bring to a simmer and stir until the sauce thickens a bit and the cheese is completely melted. Stir in the cooked pasta and spoon into the prepared baking dish. Sprinkle with the diced tomatoes and place under the broiler for 2 to 3 minutes, until the top browns. Remove from the oven and allow to cool for 5 minutes before serving.